CHARLOTTE, N.C. (February 24, 2013) - Fans of Dale Earnhardt Jr. will try to defend a 10-year win streak as voting opens today for the NASCAR National Motorsports Press Association (NMPA) Most Popular Driver Award. Fans can vote online once a day throughout the 2013 Sprint Cup Series season to earn their driver the coveted "most popular" trophy. This year marks the first year of eligibility for Sprint Cup rookie Danica Patrick, whose fan base could push voting activity and award competition to a new intensity. Fans can visit www.MostPopularDriver.com and vote once a day for their favorite NASCAR Sprint Cup driver among the 39 eligible. All 39 will remain eligible for voting throughout the entire Sprint Cup Series season. Voting will conclude Nov. 17 at 11:59 PM ET after the season's final race at Homestead Miami (Fla.) Speedway. The winner will be announced at the NASCAR NMPA Myers Brothers Luncheon in December. Earnhardt Jr. notched his 10th straight NASCAR NMPA Most Popular Driver award last season, tying a record for consecutive wins set by Bill Elliott. Elliott holds the record for most overall wins with 16. Patrick, who made history last week by becoming the first woman to earn a Sprint Cup pole and to lead the Daytona 500, could challenge Earnhardt Jr.'s streak with her far-reaching fan base that includes women, girls and cross-over fans from her open-wheel racing career. "Dale Jr.'s fans have really staked a claim on this award for the past decade, but the vote could get interesting this year," said Kenny Bruce, president of the NMPA. "We've had some close competitions in the past, so there are actually multiple drivers who could break the streak, and Danica is certainly one of them." The NMPA Most Popular Driver distinction has been awarded every year since 1956. At one time, the contest was decided by a poll among drivers, taken at the end of the racing season. Later, members of the media determined the winner. Today, race fans from all over the world make the ultimate decision. 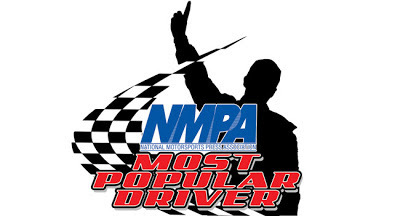 For more information and to vote on the NASCAR NMPA Most Popular Driver Award, visit www.MostPopularDriver.com.